Consumer demand for Apple’s anthology of products has increased year over year promising a positive Quarterly Earnings announcement next week on Tuesday, October 27. 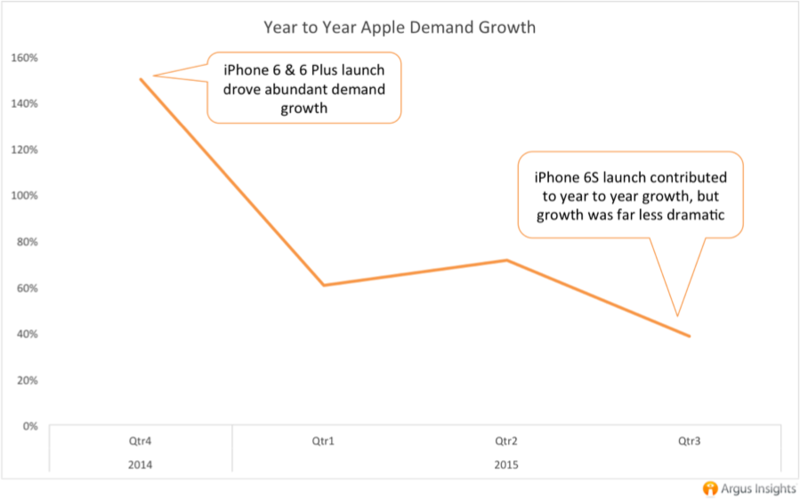 While Apple’s Q3 demand has grown about 40% year over year, this improvement has fallen greatly since the nearly 150% demand growth that corresponded with the launch of the iPhone 6 and 6 Plus in September 2014. The recent 6S launch is shaping up to be nothing short of a success, but Apple is used to smartphone market conquests, and the 6S line is falling short(er than the iPhone 6). According to consumer demand trends across all of Apple’s hardware offerings, the company’s Q3 earnings will be positive due to increased demand across segments like Smartphones, Tablets, and Wearables, but, this growth will not be as extreme as past quarters with big handset launches, namely Q4 2014. Apple Tablets and Smartphones both contribute enormously to Apple’s bottom line. Consumer demand patterns for these segments have been similar, with extreme year-to-year demand growth in Q4 slowly waning down to about 40% growth in Q3 2015. When Apple first released the 6S in September 2015, we predicted that this handset would begin the iPhone’s Farewell Tour, and now that the handset has launched, we see strong evidence of this prediction coming to fruition. While consumers have been slower to adopt the iPhone 6S and 6S Plus, they are reporting extremely positive experiences, the lack of #bendgate and overall high quality of the new S models have resulted in higher delight ratings from launch than the 6 line, though this delight comes with significantly less demand. 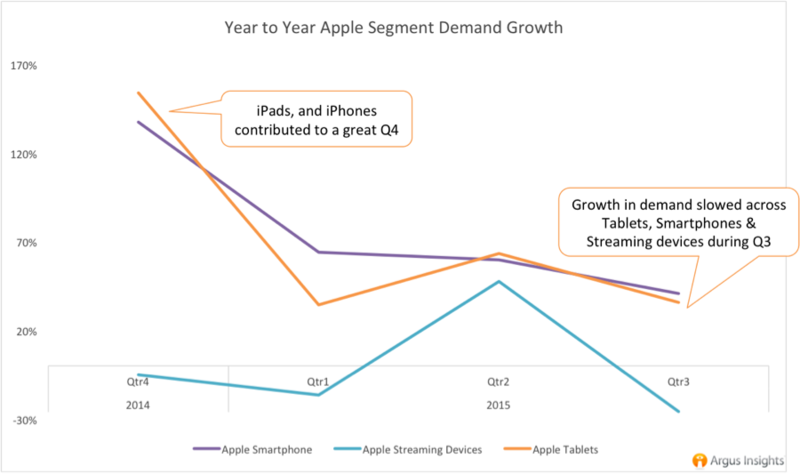 While Tablets and Smartphones continue to drive demand, Apple’s Streaming Devices saw a drop in year-to-year consumer demand to inhibit Apple’s growth, after a rise in Q2. Apple clearly had a good Q3 2015, but they have done better. The iPhone 6S and 6S Plus launch was decent, but did not drive nearly as much interest as their last handset launch. While still positive, tablet growth is slowing as well. Apple dove into the wearables space with the Apple Watch, and is seeing buzz from happy users increase slowly but surely as availability improves. Overall, Apple’s growth is slowing, but the company continues to grow year over year, and please their users along the way. Want to track shifts in demand as they happen? Our 20/20 Demand Scorecards project demand and track shifts in consumer buzz and delight for the 20 most popular smartphone brands and products each month. Also available for Wearables and Smart Home markets. For weekly insights, subscribe to our free newsletters. Is the iPhone 6S a smash hit? Apple may offer clues Tuesday | First News Feed – One world. One Page.